I don’t want to say much (for once!) 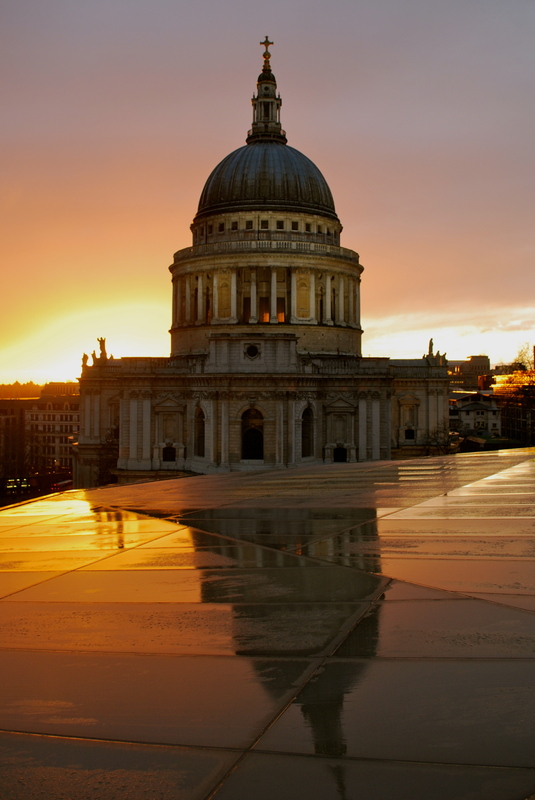 as it might distract from the beauty of Saint Paul’s Cathedral bathed in a London sunset after rain. So enjoy and don’t forget to comment! Great shot!! I like very much the composition and light. Fabulous colours and the reflection is fantastic!! Well after surviving an intentional bombing by Hitler, I’d be pretty proud of it too! St Sulpice is VERY simple, That’s what I like about it. It has the feeling like Indiana Jones is about to find some ancient artifact buried beneath it 😀 St Paul’s is just magnificent. I found it literally awe inspiring. As always.. amazingly captured beautiful moment! and as always very kind! Oh, nothing could distract one from this photo! Religion should be like this. Pure, spacious and illuminated. Lit from within. Love the light in the upper windows (?). Couldn’t agree with you more! I think its the sunset streaming through but it is rather stunning isn’t it? Supremely! The picture has such a beautiful clarity to it too. It is so…clean. This is a very strong shot. Is that all natural sunset color? Oh man. I want to be there so bad one day. Yeah it the naturally colouring, beautiful isn’t it? Hello Webmaster, I noticed that https://coffeeandcountries.wordpress.com/2012/02/21/religion-reflected/ is ranking pretty low on Google and has a low Google PageRank. Now the Google PageRank is how Google is able to see how relevant your webpage is compared to all the other webpages online, if you cannot rank high at the top of Google, then you will NOT get the traffic you need. Now usually trying to get to the top of Google costs hundreds if not thousands of dollars and very highly optimized targeted marketing campaigns that takes a team of experts months to achieve. However, we can show you how to get to the top of Google with no out of pocket expenses (free traffic), no stupid ninja tricks, no silly mind control techniques, and this will be all white hat with no blackhat software or tactics that could possibly land you on bad terms with Google and put you in the dreaded “Google Sandbox”. We’ll show you how to easily capture all the targeted traffic you need, for free, multiple ways to land fast (not months) first-page rankings in Google and other major search engines (Bing, Yahoo, Ask, etc), even show you strategies on how to earn daily commissions just try Ranking Top of Google, please check out our 5 minute video. Thank you! 😀 You have beautiful pictures here as well, I mean look at this pic! I don’t think anything I’ve ever done has been described as glorious, I’m honoured!